Habit: Plant occasionally with skunk-like odor. Stem: 9--32 cm, branches 1--several from base, tufted-woolly-hairy near base, generally glandular above. Leaf: basal in rosette, 1--2-pinnate-lobed, tufted-woolly-hairy; axis < 3 mm wide; lobes generally ascending, toothed on both sides, teeth short-pointed or acuminate. Inflorescence: spreading, showy; flowers few to many. Flower: calyx 2--5.7 mm, gland-dotted, lobes acute to acuminate; corolla 8--32 mm, tube purple, throat yellow proximally, blue distally, lobes pink; stamens reaching below corolla lobe middle; style > stamens. Fruit: 3--9 mm, < calyx, ovoid to spheric; valves detaching. Seed: 12--60. Leaf: basal 1--5 cm, +- tufted-woolly-hairy. Inflorescence: flowers many; pedicels slender, spreading, pairs +- equal. Flower: calyx 2--4 mm; corolla 8--23 mm, tube generally < 2 × calyx, throat cup-shaped, lobes +- 3 mm wide; stamens reaching below corolla lobe middle. Fruit: 4--7 mm, widely ovoid to spheric. Seed: 12--18. Chromosomes: 2n=18. Citation for this treatment: J. Mark Porter 2012, Gilia cana subsp. 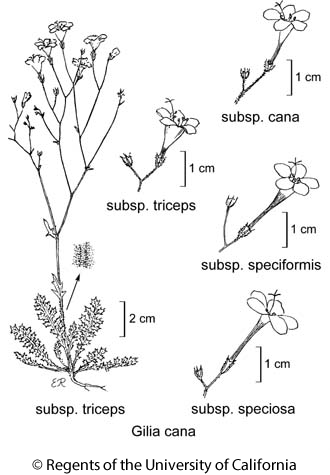 triceps, in Jepson Flora Project (eds.) Jepson eFlora, http://ucjeps.berkeley.edu/eflora/eflora_display.php?tid=50760, accessed on April 19, 2019.
s SNH, W&I, WTR, DMoj; Markers link to CCH specimen records. Yellow markers indicate records that may provide evidence for eFlora range revision or may have georeferencing or identification issues. Purple markers indicate specimens collected from a garden, greenhouse, or other non-wild location.